The winter moth, which has caused widespread damage already in southern New England, has moved into eight more communities since populations were first discovered in Maine a year ago. State officials, concerned that the moths might be spreading even farther around the state, are asking residents to watch for the drab, light brown, tan or gray moths. In its larval stage, the winter moth can denude trees, eating the leaves and ultimately weakening them enough so that a secondary stressor such as drought or disease can debilitate and kill them. A limited number of moths, only males, were spotted initially along the Maine coast in 2006 by entomologist Joe Elkinton, a professor at the University of Massachusetts at Amherst. The moth remained very limited in the state — until now. It was found in Harpswell in December 2011, and in Vinalhaven in the spring of 2012; but over the past few days, a spate of sightings occurred in Cape Elizabeth, said Charlene Donahue, forest entomologist with the state Department of Agriculture, Conservation and Forestry. 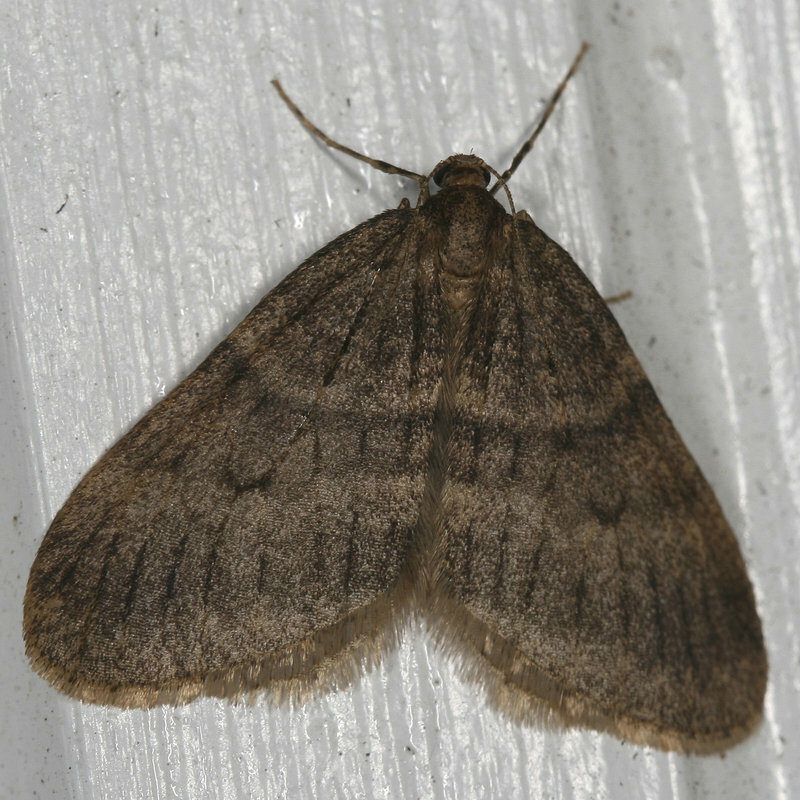 In 2006, no females of the species, Operophtera brumata, had been detected in traps in Maine, and no defoliations had been found, so the moth was not considered a problem here. The first full populations of moths weren’t found until 2011, and only in one coastal community, Harpswell. The sudden increase in reported swarms has been unexpected, and officials are trying to monitor where the moths are flying. “It is unusual,” Donahue said. A state alert about the moths was issued Tuesday and by midday Wednesday, Donahue already had received reports of 13 sightings of moths flying in Cape Elizabeth, as well as scattered reports from Scarborough, South Portland, Portland, Falmouth, Woolwich, Westport Island and Brunswick. Winter moths, which are believed to have been introduced into North America from Europe, were found in Nova Scotia as early as the 1930s. They have become a serious problem in Massachusetts over the past several years, particularly in coastal communities south of Boston and on Cape Cod. The potential economic effect of a winter moth infestation in Maine is difficult to estimate, Donahue said. It strikes several species of trees and shrubs here, including oak, maple, apple, elm, ash, crabapple, cherry and blueberry. In Massachusetts, Elkinton said, no damage estimates have been determined in terms of forests, crops or home landscapes; but the pest has been particularly destructive in blueberry fields, and to a lesser extent in apple orchards that haven’t been sprayed with insecticides. Donahue said homeowners are likely to face increased costs for prevention and treatment of vulnerable plantings, as well as dealing with trees that might die over several years. Another recent pest, the emerald ash borer, posed a threat to the 6.7 million cords of ash harvested in Maine each year, with a value of $140 million annually. That figure does not represent a major component of Maine forests, said Kenneth Lawtsen, biometrician for the Maine Forest Service. By comparison, winter moths pose a vastly more significant potential threat because they can affect all hardwoods, not just a single species, he said. Elkinton said the moths have remained almost exclusively “a coastal phenomenon.” What’s still unknown is how warm weather trends may affect their ability to spread. Usually, the moths cling to the coasts, where temperatures are more moderate; but if interior parts of the state remain temperate enough, the moths may move inland. The moths are an unfamiliar threat for now. Nonetheless, state officials are asking residents to watch for the moths, which are in their adult phase at this time of year and most likely to be seen flying in swarms ranging from dozens to hundreds, Donahue said. If people think they see a swarm, they are asked to try to capture some specimens. Adult moths are active from late November to January, whenever the temperature rises above freezing, as it has for several days recently, Donahue said. Males are small, light brown to tan; females small and gray, with smaller wings, incapable of flight. The moths are drawn to porch lights or lamplight filtered through window or door screens. They also may be seen around deciduous trees, where they mate, or crawling at or slightly above the trunk base. Winter moths are difficult for a lay person to distinguish from similar-looking species, but if a swarm of dun-colored moths is seen flying at this time of year, probably they’re winter moths. Winter moths have moved in every direction in and beyond Massachusetts. Their devastation has been felt as far south as Rhode Island, where they have been seen for a decade, and north through New Hampshire into southern and coastal Maine. Entomologists theorize that the pest arrived here in cocoons buried in the soil of landscape trees and plants from infested parts of other New England states, Donahue said. Because winter moths pupate in the ground, they can be moved in soil from late May through December. Caterpillars can be spread accidentally on and in cars, boats and even clothing and boots. They have no natural enemies in North America to keep the populations in check. A parasitic fly, Cyzenis albicans, has been established in six Bay State communities and is showing some effectiveness in controlling the winter moth, Elkinton said. Any moths that can be caught or trapped should be placed in a plastic bag and delivered for positive identification to Donahue at the Forest Entomologist Insect and Disease Laboratory, 168 State House Station, Augusta, ME 04333.